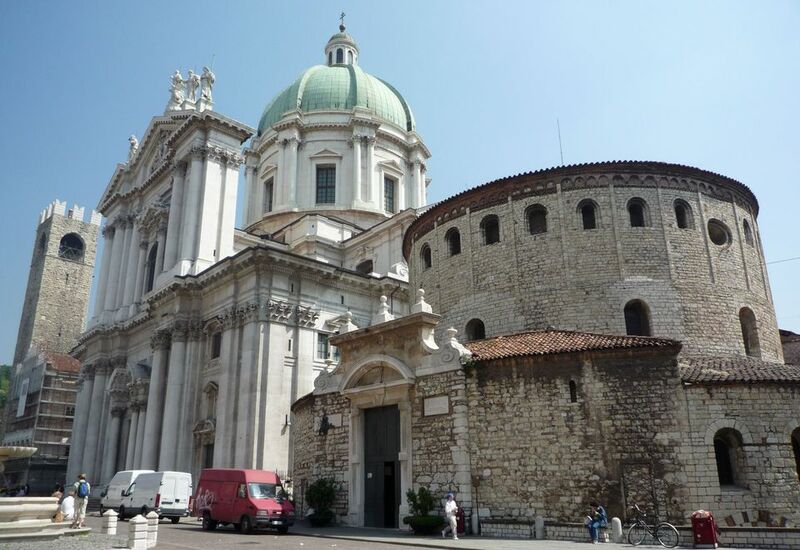 Though often overlooked by tourists, Brescia, Italy is an interesting city with a castle, Roman ruins, Renaissance squares, and a medieval city center. Brescia is east of Milan in the Lombardy region of northern Italy. It's between Lakes Garda and Iseo and is a gateway to the Valcamonica (a UNESCO site with the largest collection of prehistoric rock art in Europe) to the north. Brescia is on several train lines and is easily reached by train from Milan, Desenzano del Garda (on Lake Garda), Cremona (to the south), Lake Iseo, and Val Camonica (to the north). The city is on our suggested Milan to Venice train itinerary. A local bus connects the station to the city center. Buses also connect to other nearby cities and towns. Brescia has a small airport serving flights within Italy and Europe. The closest large airport (with flights from the US) is in Milan. The small airports of Verona and Bergamo are also close. (see Italy airports map). Tourist Information can be found at Piazza Loggia, 6. Piazza della Loggia - The city's prettiest square was built in the 15th century. Torre dell'Orologio or the clock tower, was modeled on the campanile in Venice's Piazza San Marco. Porta Bruciata, in one corner, is a medieval tower and gate. Cathedrals - The two cathedrals are found on Piazza Paolo VI. The Rotondo is the old 12th-century cathedral. Inside you can see Roman remains and the apse of an 8th-century basilica. The new cathedral is late Baroque style and took over 200 years to complete. Via dei Musei - The old Roman road is lined with Roman ruins including the Roman forum, a theater and a temple built in 73AD. Monasteries - Monastery of Santa Julia was founded in 753 and has three churches. It now houses the city museum with artifacts from prehistory to the 20th century, including a Roman excavation and three historic churches built in different styles. San Pietro in Lamosa was founded in the 11th century and is Romanesque in style. It's part of a UNESCO World Heritage Site: Longobards in Italy, Places of the Power. Piazza della Vittoria - This large square was built in 1932 in what was once a medieval center. On one side of the square is a 60-meter tall tower. The Mille Miglia race starts from Piazza della Vittoria and on the third Sunday of the month there's an antiques market. Castle - The medieval castle complex on the hill includes towers, ramparts, gardens, courtyards, drawbridges and several underground tunnels. It houses the Ancient Arms Museum, Risorgimento Museum, and a model railway exhibit. From the highest point, there are good views of the city below. Brescia is famous for the Mille Miglia historic car race held in spring. It starts and ends in the city. The Fair of San Faustino and Giovita in February is one of the biggest festivals. The festival of Franciacorta celebrates the sparkling wine produced in the hills outside the city. Music performances are held in the Teatro Grande, a theater built in the 1700s.